the bottom one I believe to be crassula aregentea. the one above that i think is echeveria perle von nurnberg. I hope that someone can help me identify each one of these. As for the last one, I'm thinking that it's most likely Kalanchoe thyrsiflora, based on the chalky powdery substance on the leaves, and the red tinge that you describe. All of these plants are relatively easy to grow, with fast draining soil, bright light and a good watering about twice a month. If you can, allow them to dry out between good soakings. Quite often, these types of plants are just labeled as 'succulent' which means that they have fleshy leaves and are drought resistant; many box stores carry a mixed bag, and mostly these are low maintenance, easy to propagate, and will take a lot of abuse. Keep in mind that one type of mis handling is bound to kill them, and that's to overwater them. If in doubt, don't water. 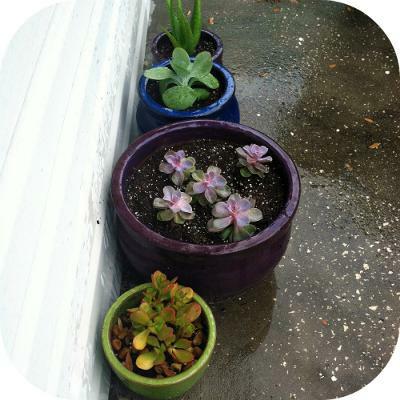 See also the page on succulent care for more information on how to successfully grow these interesting plants.